While health care and the economy are the major issues dominating national news these days, the United States remains a nation at war, less anyone forget. One person who certainly hasn't forgotten is Woodbury native and Auburntown resident Jennifer Duggin, a supply specialist for the HHT 1-230th ACS (Air Calvary Squadron) Unit of the Tennessee National Guard, Smyrna. Duggin, who is currently stationed in Northern Iraq, said one of the reasons she is serving her country is she wants people to remember why our country is at war, and the sacrifices hundreds of thousands of citizen soldiers have made since the War on Terror began eight years ago. "I just want to make sure people remember we are here and why we are here. I don't want any soldier forgotten, I don't want this to be like Vietnam. Those soldiers were treated so poorly when they returned home, not like the hero's they were/are," Duggin said in a recent e-mail interview with the Courier. 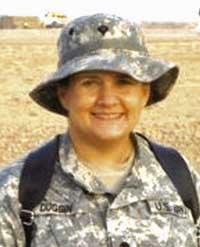 A 1992 graduate of Cannon County High School, Duggin first joined the National Guard in 1991, during her senior year. She stayed in until 1999, took a five-year break, and re-enlisted in 2006, making this her 13th year of military service. While she has always felt honored to be be able to serve her country, Duggin says this year has been one of the toughest of her military career. One of the reasons is she leaves behind a husband, Wade Duggin, and four children: Jacob, 21; Danielle, 20; Will, a 14-year-old freshman at CCHS; and Austin, nine, a fourth-grader at Auburn Elementary. Wade is a 22-year employee of EJ Company in Woodbury. "The sacrifice that comes with being part of our armed forces is very difficult," Duggin said. "I miss my family so much. The hugs, my children laughing, girl days with my nieces, sitting and talking to my parents and my sister. Sitting on the porch with my husband, going to church, buying groceries. I miss so many things we take for granted, but most of all I miss MY Freedom. The daughter of Bill and Mary Melton, Duggin has a sister, Tina, who has served two tours in Iraq with the U.S. Navy, and two nieces and two nephews. "I left Tennessee in March of 2009 and we went to Ft. Sill, OK for two months of pre-mobilization training," Duggin said. "We got in country (Iraq) in June 2009 and we are scheduled to be here until Spring of 2010. I am a supply specialist for my unit, HHT 1-230th ACS (Air Calvary Squadron) Tennessee National Guard, Smyrna. We are an aviation unit with two types of helicopters, 58D, and Blackhawks." Like many soldiers stationed on the front lines of the War on Terror, Duggin's role may not be the most glamourous, but it is vitally important nonetheless. "I am the rank of Specialist. My duties include making sure my unit and soldiers have the supplies to complete the mission at hand. Anything from ammo, food, ink pens, trash bags, to Gatorade. I suppose you could say I work at Wal-Mart for my unit, just alot harder work and in very HOT conditions," she said. Despite the hardships, Duggin says the experience of serving in Iraq is one she does not regret. "I love the pride that comes with wearing this uniform, and I know just what it takes to be qualified to wear a military uniform. I am so proud to serve in our United States Military," she said. "I have made some of the best friends, I have seen and done things that you couldn't even imagine. This journey has definitely been life changing for me, in good and bad ways." As can be expected, the downside has been being away from family and friends. However, Duggin knows that sacrifice is a big part of being a soldier and keeping America safe from terrorists. "In order to give freedom to our wonderful country and the people of the USA, we the soldiers have to sacrifice our freedom," she said. "I miss the everyday things that we take for granted and don't ever think about. But all that will come in time, when my job here is complete. "The support I have received from the place I call home, Cannon County, Tennessee, my family, friends, and people I have never met has been amazing."